To start the adoption process, click the link below to complete a Cat & Dog Adoption Questionaire. All applicants must be 21 years or older and be able to provide a picture ID once accepted. Also, please understand that the application process can take a few days, so cats/dogs will not be going home with you the same day. Please answer each question completely, the more information you give to us the better we can match a pet with you and your family. Thank you! Click to see How to Integrate a New Dog. Click to see our Current Available Animals. Click here to complete a Cat & Dog Adoption Questionaire. Click here to see a New Adoption Shopping List. Click here to see New Dog Adoption Tips. Click here to download a Dog Health Sheet. Click here to see Tips for the First 30 Days of Dog Adoption. Have questions about Adopting a Rescue Dog? 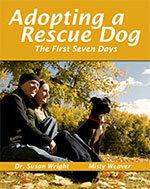 This free book guides you through the first seven days of Adopting a Shelter Dog. With seven simple lessons, the book helps you ease the transition from shelter life to home life for you and your pup. You can download your copy here. Donations save lives! The more donations we receive the more animals we can save. Please consider being a monthly donor. Simply click the PayPal™ donation button at the bottom of this page and know you helped save an animal that deserves a better life! !